When it comes to our rare high-quality historic records, and the real long term trends of Australian weather, the silence is striking. There are some excellent historical records of long term temperature data from the late 1800s in Australia, which lie underused and largely ignored by the BOM. For the BOM, history almost appears to start in 1910, yet the modern type of Stevenson screen thermometer was installed across Australia starting as early as 1884 in Adelaide. Most stations in Queensland were converted as long ago as 1889 and in South Australia by 1892. Though states like NSW and Victoria were delayed until 1908. Here’s a photo of the ones in Brisbane in 1890. The BOM don’t often mention all their older temperature data. They argue that all the recordings then were not taken with standardized equipment. The BOM prefers to start long term graphs and trends from 1910 (except when they start in 1950 or 1970, or 1993). The BOM was set up in 1908. Before that there were Stevenson screens going in all over Australia, but somehow these records appear uninteresting to climate researchers. Could it be that the late 1800s would have been more captivating if they were colder? In the late 1800′s there was the widespread heatwave of 1896 killing hundreds of people and recording 50C plus temperatures across the continent as well as the infamous Federation Drought? Not only were some stations using Stevenson screens in Australia, but other types of non-standard but common screens were documented, along with sites, and there were studies of overlapping data. (Though there were also some highly irregular sites that would defy analysis). More to the point, with millions in government grants available for research, the BOM could even recreate some historic sites and do modern side-by-side comparisons. Surely in the space age we can figure out the temperature differences of wooden boxes? Suppose for a moment that the old records showed cool summers, or demonstrated that Australia had warmed by two degrees instead of one? Wouldn’t there rather be a flood of papers adjusting and homogenising Glaishers and Stevensons, and perhaps even sheds and octagons? Whole new museums could spring forth, recreating sacred meteorology stations from 1862. School children would file by and gasp! Jennifer Marohasy wonders where the CRU got the data that the BOM don’t want to use. She has been writing about the Stevenson screens and asking the Australian BOM questions like this and more. Warwick Hughes has been analyzing these old records even longer. His paper in 1995 provoked the Neville Nicholls reply of 1996 (which is used to create the map below). Above, the year that Nicholls 1996 describes “most” stations as being shifted to Stevenson screens. There were a few late exceptions to these dates. Although there were many sites, especially in NSW and Victoria that didn’t get Stevenson screens until sometime in 1907, vast areas of Australia in WA, Queensland and South Australia have accurate older data. When “hottest” ever records for these states are announced, why are the older high quality measurements almost invisible? Jennifer Marohasy describes how he drove the installation of these instruments at post offices in South Australia and the Northern Territory. 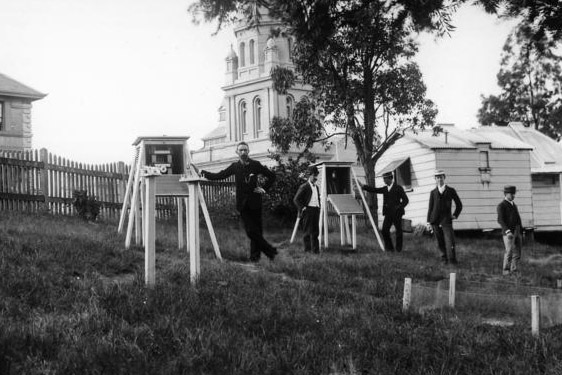 In Queensland the state meteorologist Clement Wragge took up the Stevenson screens, very quickly installing them across Queensland during 1889. In Western Australia people tended to take their cues from Todd in South Australia, using the same octagonal design at Perth Botanical Gardens as was used in Adelaide, and single louvre wall shade screens in most other stations in the colony. 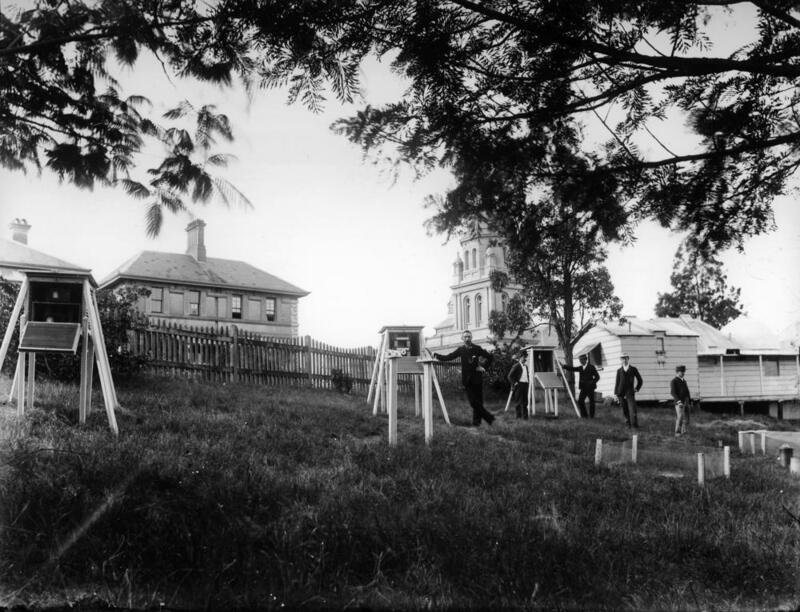 William Cooke, the first Government Astronomer of the Colony, replaced most meteorological stations with Stevenson screens “before the end of 1897″ (Nicholls, 1996). Lance Pidgeon wrote about the comparisons of the octagon designs and the Stevenson screens, and I’ll do a post soon talking about comparisons of Glaisher and Stevenson screens. In Victoria and NSW temperatures were recorded in a mix of “sheds” or “stands” that are quite different to the Stevenson screen. But plans for some of these are available, and it would be possible to build and recreate similar structures to compare the different types of screens. In Tasmania meteorologists used shelters or sheds til 1895, then installed Stevenson screens after that. So screens were installed reasonably early, though Nicholls notes “but they were in disrepair by 1907″. The BOM sweat to issue press releases telling us how serious “climate change” is, and how it will hit Australia harder than the rest of the world. They make sure Australians know all the infinite details of projections from climate models we know are broken. But when it comes to our rare high quality historic records, and the observed long term trends of Australian weather, researchers mostly seem to have something better to do. It’s OK to adjust modern Stevenson screens with stations 300km away to rescue a signal, but the old data is apparently beyond hope. Who wants to add 10 or 20 extra years of data? The interminable tedium of those long term natural trends! Years of toil and diligent care collect dust in backroom archives. “Nothing to see here”. Hughes, W.S. (1995) Comment on D.E. Parker, “Effects of Changing Exposure of Thermometers at Land Stations.” International Journal of Climatology, Vol. 15, pp. 231-234. Excuses Excuses! Neville Nicholls and the Stevenson screens that didn’t exist or did and were “cracked”? The mysterious lost hot Sunday in Bourke, did it really happen? h/t Special thanks to the independent BOM audit team for advice, information and ideas.